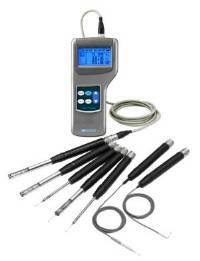 6501 Kanomax Climomaster Hot Wire Thermo-Anemometer. Precision anemometer with interchangeable probes. · 2% air velocity accuracy—the highest on the market! · Optional differential pressure sensor can be added to any model. · Optional 28" telescopic extension, straight or flex-neck.